Beautiful 2 Bedroom, 2 Bathroom Villa with 24 Hour Security on-Site at the Hilton Head Beach & Tennis Resort. New kitchen, new bedrooms and new floors. Located between Port Royal Plantation and Palmetto Dunes, just Off of Folly Field Road. Our resort is most known for our Olympic Size Pool, it's the largest oceanside pool on the island (directly on the ocean), in addition, Admirals Row guests have their own private pool that is quieter and more adult oriented. There is a children's playground plus bike rentals are offered at the resort. HHB&T Offers 24 Hour Security, around the clock ground patrolling and checking passes at the Security Gate. Our fully-equipped, beach Villa is located on the first floor. Our two bedroom condominium is just a few steps away from one of the East Coast's most beautiful beaches. There will also be an $90 cleaning fee added to the cost. All renters will need to pay a security deposit which will be refunded after the condo is inspected. Our villa offers a living room with queen-sized sleeper/sofa, dining room, wet bar, and kitchen. The master bedroom has a queen-Size Bed, and a private bath. The second bedroom has twin beds. There is a second full bath off the hall. Phone with local free calling/answering service. Air Conditioning, 24-hour security. Coin Washer and Dryer Located by Elevator on Floors 2, 3, and 4. 10 Tennis Courts, Auditorium with Concerts During the Summer, Largest Pool Bordering the Ocean on Hilton Head with another pool beside Admiral's Row. This property was in a great, safe, secure location. The place was nice and clean. No issues to report. I stayed for over a month and the entire experience was perfect. It is also in a perfect location being in the middle of the island. Nice condo!!! Short walk to the beach. Resort had daily activities for the kids!!! The condo was updated. It was clean and had plenty of room for our group of six. The beach was beautiful and easy access from the condo. We enjoyed the pools and the playground area. The resort staff was friendly and helpful. The resort had so many activities that the kids were happy to stay on site. They attended movie night at the pool, the pool party, which had music and dance contests, slid down the inflatable waterslide, and sang along with others on karaoke night! We missed the craft making. We had a great week!!! We stayed in August 2016, it is very nice spacious condo, great location with short walk to the beach. Very helpful owner quick to respond. Overall, great value for Hilton Head. We hope to return next year. A lot of great opportunities for families- playground, kids activities, great pool! We have stayed in this unit 3 years in a row. 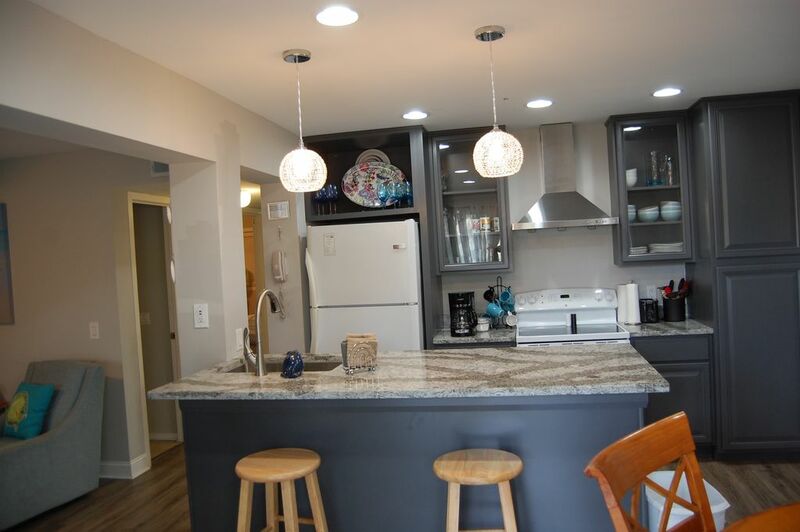 It is clean, nicely decorated and easy access to the beach! We love it! If you're looking for a low priced 2 BR rental near the beach, this is a solid alternative. However, the furniture was shabby and mismatched and my real concern is that the place wasn't the cleanest. The floors were dirty (not sandy, but dirty), there was a layer of gunk/grease left in the sink drain, and even a dead bug on the wall that had been smushed there by a previous visitor. Again, nothing totally horrible, just some room for improvement. I have had a couple of comments on the condition of the condo so I have replaced the cleaning company and will monitor more closely. The beds are new, the couch is new and the chairs in the living room are fairly new. They are not look alike furniture but they are matched and we believe they look good as a group. We stayed in this condo in August 2014. Great location- great condo! Loved our stay in HHI.